Lion Vivian Reid was nominated for a Melvin Jones Fellowship by her fellow Lions for her years of outstanding service. The award was presented by the West Hill - Highland Creek Lions Club president Terry Fontana at the club's holiday dinner at the Old Scott House. Once again the West Hill - Highland Creek Lions Club hosted its annual Craft Sale featuring dozens of local vendors. For the children, the Lions and Community Centre staff set up crafts and games, including even a vist from Santa Claus! The West Hill - Highland Creek Lions Club presented awards totalling $600 to three students at Sir Olvier Mowat Collegiate and one student at West Hill Collegiate at their respective commencement ceremonies. The West Hill - Highland Creek Lions Club presents these awards every year to students at the various high schools in the area to reward academic performance and community service. The West Hill - Highland Creek Lions Club donated US$1,000 towards the large-scale relief effort launched by Lions and Lions Clubs International Foundation (LCIF). LCIF has mobilized more than US$200,000 to help the earthquake victims. Lions have provided survivors with shelter, food, water, medicine and other necessities. The West Hill - Highland Creek Lions Club on October 15 donated US$1,000 to the LCIF Hurricane Katrina Relief Fund of US$500,000 to assist with both short and long-term needs. Another US$1,000 was donated on January 25 of this year to the LCIF relief effort to help victims of last December's tsunami. Members remarked that it has been a truly disaster-filled year. The West Hill - Highland Creek Lions Club, celebrating its 61st year of strong commitment to community service, continues to support many local activities such as school bursaries and programs for children and the handicapped. 100% of every dollar raised is awarded to charities and worthwhile causes. The West Hill - Highland Creek Lions Club donated $1,000 US towards the large-scale relief effort launched by Lions and Lions Clubs International Foundation (LCIF). LCIF has mobilized more than $500,000 US to help victims of Hurricane Katrina. Lions have provided evacuees with food, water, medicine, personal hygiene needs and other necessities. The West Hill - Highland Creek Lions Club also contributed $1,000 US to the LCIF relief effort to help victims of last December's tsunami. The West Hill - Highland Creek, celebrating its 61st year of strong commitment to community service, continues to support local activities such as school bursaries, children's sports teams, etc. 100% of every dollar raised is awarded to charities and worthwhile causes. SCARNATI, James John 'Jim' - Peacefully, in his 64th year, on Thursday, September 15, 2005 at the Scarborough General Hospital, with family by his side, after a short but courageous battle with cancer. Beloved husband and best friend to Donna for over 41 years. Dearly loved Bubba to son Jim and his wife Liz. Dearest brother of Bill and his wife Debbie (Michigan). He will be sadly missed by 'The Boys', Muggs and Harley, and his entire family in Thunder Bay, across Ontario and Western Canada. Jim's life will be defined by his 32 years of service to the L.L.B.O. / A.G.C.O. ; dedicated Member and Past Officer of the West Hill Highland Creek Lions Club for over 36 years; Canadian Director of the Retreads International Motorcyle Club (XL+); also a member of Los Silverados. Long time member of the Royal Canadian Legion Port Arthur Branch 5. Friends will be received at the Highland Funeral Home, Scarborough Chapel, 3280 Sheppard Avenue East (Just west of Warden) on Saturday from 7-9 p.m. and Sunday from 2-4 and 7-9 p.m. A Lions Memorial Service will be held on Sunday at 7:30 p.m. The Funeral Service will be held in the Chapel on Monday, September 19, 2005 at 11:00 a.m. Cremation to follow. By family request, donations in Jim's memory may be made to the Canadian Cancer Society, the Hospital for Sick Children, the Children's Wish Foundation, or to the Toronto Humane Society. As they have done every year since turning over the running of the Highland Creek Heritage Day festival, the West Hill - Highland Creek Lions Club marched in the parade and also ran the children's fun area. The children's fun area had pony rides, a story teller, children's games (including air-bounce) and a petting zoo. 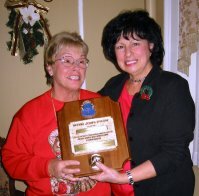 Lion Johnnie McBrearty was nominated for a Melvin Jones Fellowship by her fellow Lions for her outstanding service. The award was presented by the West Hill - Highland Creek Lions Club secretary and long-time member Jim Scarnati who is also a Melvin Jones Fellow. On January 25, 2005 the club voted unanimously to dontate $1,000 U.S. to the tsunami relief efforts through the Lions Club International Foundation (LCIF). The LCIF distributes the money to relief efforts coordinated by local Lions Clubs in the affected areas. More information on the LCIF's efforts can be found at http://www.lions-tsunami.org/. 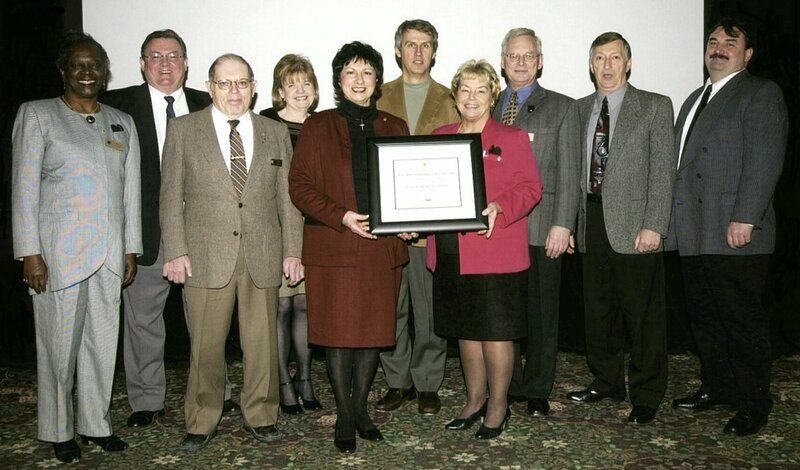 We are proud to announce that on January 10, 2005, the West Hill - Highland Creek Lions Club was awarded the Long Term Service Awards by the Scarborough Community Council Toronto Parks and Recreation East District, at its 47th Annual Volunteer Recognition Night, for outstanding achievement and service to the community. The major objective of the Club in its early years was the establishment of a recreation centre and, to this end, acquired the property now known as Heron Park. The land was eventually deeded to the then Scarborough Township, who further developed the property to include a swimming pool, tennis courts, an arena and other recreation facilities. 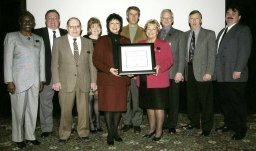 Over the last 60 years, the Club has actively supported and sponsored many projects, including youth sports teams, bursaries to local high schools, local seniors' groups and hospitals, kidney and diabetes foundations, summer camp for children with disabilities, the C.N.I.B., and many others. The Club looks forward to its continued participation in and support of new and existing projects.